Foodies from around the world gathered for the culinary event of the year, Vegas Uncork’d by Bon Appétit The Grand Tasting on Friday, May 9, 2014. Some of the finest chefs in the world put their talents on display at the signature culinary event at the Garden of the Gods Pool Oasis at Caesars Palace Las Vegas. Celebrity chefs put their talents on display at Caesars Palace Las Vegas for the first night of Vegas Uncork’d by Bon Appétit on Thursday, May 8, 2014. Renowned chefs Bobby Flay, Giada De Laurentiis, Gordon Ramsay, François Payard, Guy Savoy, Nobu Matsuhisa ,Frankie Pellegrino Jr. and Greg and Marc Sherry prepared special menus as part of the sold out Master Series dinners. The Chase Sapphire Preferred Grill Challenge will take place during Bellagio’s Block Party at the seventh annual Vegas Uncork’d by Bon Appétit on Saturday, May 11, at 8:45 p.m. Chase Sapphire Preferred®, a premier travel rewards card from Chase, in partnership with Bon Appétit, will host the live culinary challenge. UNLVino is expanding to four days of spectacular events by introducing a mixology-focused “BAR-b-q” on Sunday, April 21 from 11 a.m. to 2 p.m. 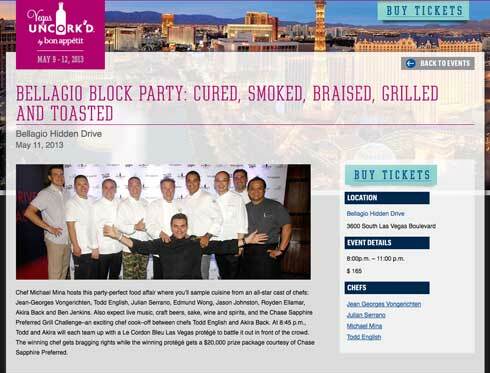 The event will feature celebrity chefs Scott Conant, Angelo Sosa and Gustav Mauler; craft cocktails by Master Mixologist Francesco Lafranconi; and farm-to-table, gourmet fare from a collection of Las Vegas’ favorite restaurants.